Kucoin.com Review 2019 – Scam or Not? A lot has changed since Bitcoin was introduced a few years ago. The prices had come up and down but the demand for BTC has exploded. This is the reason why there are a ton of Bitcoin exchange websites today! Over the past few years, most of the common folk have only been watching in the sidelines as crypto geeks kept on talking about how great the new monetary system is and how it is far more advanced than our current Fiat currencies. The digital asset game has proven its worth and now the common folk is starting to understand the value of it. Naturally, it will all calm down and remain in a straight line (the volatility) but until then, people will find ways to get their hands on any viable coin possible. Today, we will be looking into one of the exchange websites out there today. The name of the website is Kucoin.com! Join us as we take a trip into their website and experience what it is to create an account with them, explore their different verification levels, and generally know if they are a website worth investing in or something that you should stay away from. Without further delay, let’s talk about that! A little practice that we do with the team is that we need to make sure that when you want to invest into something, may it be an online or offline company, it is always great to know more about them before moving forward. Anyone can wear a mask and fool you with false advertisements and say that they are the best on what they do, but in fact, they do not have any experience in the field whatsoever. To avoid awkward issues like this, we strongly suggest reading more about the company background before investing. With Kucoin.com, their background information is not doing so well. The website does not have any physical address or any history of how the website started, and where it is based on. At this point, we thought that there is a big chance that this website is unregulated due to the lack of information provided (just like any other unregulated websites today) which are borderline scary to transact with. The only advantage when transacting with unregulated websites is that you do not need to provide a ton of personal information through the internet to start trading or using their services. It is a gamble that some people are not comfortable with. We, of course, did a little digging and found out that the website is based in Hong Kong and that their team is made of “experts” that have been in the BTC field since 2011. To get to know their team better, click this link to be redirected to the Kucoin.com team. Now let’s create an account with them and see what they are made of! One of the huge problems that we have encountered with our previous reviews is the fact that some websites are really hard to penetrate when it comes to verified account requirements. As mentioned, Kucoin.com is based in Hong Kong, which can be a huge problem if they are only servicing people from HK! To create an account, simply click on the “Sign Up” button on the upper right-hand side corner of the home page. 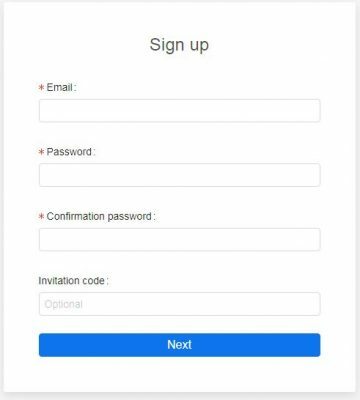 Clicking this will redirect you to the main registration page wherein an active email is required, a password for the new account, and an invitation code (if you have one) from existing customers or promotions. After you have provided all the information needed, a confirmation link will be sent to the provided email address. The last step would be clicking that confirmation link to be redirected back to their website and logged into your newly created account. What’s great about them is that you do not need to have a local phone number based in Hong Kong to create an account! Are we forgetting about something? What about their verification levels? Apparently, they do not have any verification levels compared to other exchange websites that operate today. We have seen a lot of those websites wherein users need to go through different levels of verification to get full control of an account that does not have any restrictions whatsoever. If you are looking for a website that is not regulated and has the proper platform for BTC trade against another crypto then Kucoin.com may be the website for you! But our review is not done yet, let’s move forward and get to know the website features before digging into their exchange platform. The first thing that stands out when you visit the website of Kucoin.com would be their attractive banners! 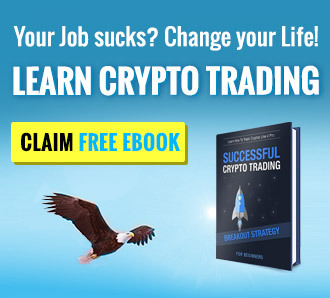 They have crazy promotions that are posted on a monthly basis, so make sure to check them out and read the available promotions before making any major trades. On the Assets tab under Markets, a marker in a form of a gift will be marked on the coin that has a current promotion going on. Click on the gift box to redirect you to the page wherein everything about the running promotion is being explained. Aside from their amazing promotions, they also have Google Two-Factor Authentication enabled for users that want to add another layer of security to their accounts. We advise you guys to download the authenticator and take advantage of this feature since having a second layer of security is always welcome especially if you are transacting with real money. Aside from their crazy promotions, the website has also a lot of cryptocurrencies to trade with. The website was just launched in 2017 but they offer a good number of coins to choose from. Traders are able to trade BTC, ETH, NEO, USDT, and KCS against literally a ton of crypto selections! And we’re not even exaggerating. They also have an invitation bonus plan which is explained perfectly in this video below! We know that you guys want to see their exchange platform! Finally, here it is! To access their exchange platform, log into your account and select from the five major coins they support. For this sample, we have chosen RPX against BTC. Click on the pair and this will automatically open up their trading platform. Everything is designed as simple as possible to avoid confusion but with the maximum availability of tools and information needed for a successful exchange platform to work. What’s even nifty is that their chart can be resized to have more space for your active orders. On the lower right-hand side of the exchange platform, you will see the orders tab wherein you will be able to place orders at. What’s great about their orders tab is that they have the automated “best price” being listed for the current price the coin is running against BTC. This comes in handy if you are a fast trader. If you are familiar with other exchange websites, they do not have this automated feature and the numbers need to be punched in manually, which takes time and isn’t as accurate as an automated one. Manual price can also be placed if you think that’s more accurate than their automated best price feature. 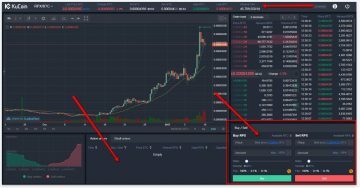 To buy/sell crypto here at Kucoin.com, all you need to do is type in the price and the amount and either click buy or sell the order. An order has been successfully placed when this will show under the “Active Orders” tab on the middle part of the exchange platform. Beside the Active Orders, tab is the “Dealt Orders” tab or where all the successful orders have been processed. This can be of great use if you want to read through your transaction history. If you haven’t noticed it yet, the website does not have any FIAT/BTC trades since this is purely a BTC exchange platform. All the available coins go against BTC and nothing else. Overall, their exchange website is something that doesn’t require a genius to figure out what’s going on! Now that we’ve touched their exchange platform, let’s talk about fees and how to get your funds in and out of the website. In reality, a website cannot be considered by most people especially if they have no idea how much it would cost them to use their services. That is why we need to talk about the fees here at Kucoin.com. It’s pretty simple actually; most of these unregulated websites usually would have lower fees to compete with regular websites that offer the same services but with higher verification requirements. Trading fees are 0.1% is charged for every asset that you have successfully bought. Deposit fees are free here at Kucoin.com that means that you do not need to worry about that! Compared to other unregulated BTC-oriented exchange websites, deposit fees are always free and in most cases, you only need to pay for withdrawals. Withdrawal fees range from 0.0005 for BTC up to 50 DENT coins. Since they have around 80 coins to trade here, it would be a waste to mention everything here. To get the complete list of withdrawal fees, please click this link. Since the website only accepts crypto trades, the only way to get your funds in and out of the website is through a deposit and withdrawal from a personal wallet. 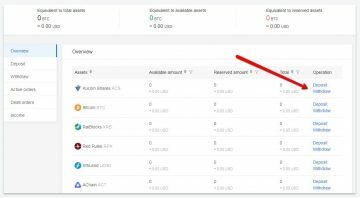 To deposit and withdraw funds, simply click the “Assets” tab found on the upper part of the account page. On the Asset page, the deposit and withdraw tabs can be accessed. Just click on the coin you want to deposit or withdraw, then the rest is self-explanatory. Just like any exchange website out there today, when it comes to deposits and withdrawals it’s not that hard to transact with Kucoin.com. We have stressed a million times on how important customer service is when it comes to websites that have access to your funds. Knowing that they have your back when an issue is experienced is really important. That is why we keep this sub-title alive when it comes to our reviews to remind you guys that always look into a website’s customer service capabilities. Here at Kucoin.com, they do not have any phone number which you are able to call, which is quite sad, to be honest. We always have a soft spot for websites that offer phone support since this is the best way to resolve an issue in the fastest way possible. The only available customer service channel that can be accessed here in Kucoin.com would be their live chat support. Their live chat support is in English but I believe they have a Chinese version too for their Chinese-speaking customers. The feature can be accessed by clicking on the “Support” box located on the lower right-hand side of the website. The unregulated website of Kucoin.com has its own ups and downs, which is pretty much normal compared to other exchange websites today. They have a great exchange platform since it’s self-explanatory and easy to use. When it comes to availability, they have a crazy amount of coins to offer. We would also like to remind you guys to read about a currency first before investing in it since pump and dumps are usually common in huge exchange websites such as Kucoin wherein there are a lot of alt coins being traded in a daily basis. Their promotions are great, which of course, you need to take advantage of if you are trading with them. All-in-all, the website is decent enough for traders that want to jump right into action without having to go through all the hassle of a verification process. Do you have an account with them? Please do share your thoughts about the website on the comment section below.